A Poke in the Eye with a Sharp Stick? Not quite! I don’t actually recoil in fright, but when I visit the dentist for any oral work, I have a simple request: a swab, a shot, the gas, and a dental assistant sitting beside me stroking my arm and whispering, “It’s going to be all right.” So imagine my panic when I found out that a solution for another problem was going to require an injection into my left eye, while wide awake. I don’t actually recoil in fright, but when I visit the dentist for any oral work, I have a simple request. On a Saturday morning some years ago, I was watching a soccer game involving a granddaughter. I looked around the park, the trees and the sky and thought to myself . . .”Well, that’s strange, everything I see in my left eye is really, really bright. Mmmmmmm, I wonder what that’s about?” Two days later I had a scheduled appointment with my doctor. I mentioned my eye and he looked it over, asked a few questions and suggested I visit my eye doctor. Soon. As far as I know I have always had high pressure in my eyes. So does my oldest sister. When I hesitated using eye drops to lower the pressure, my friend Jan jumped up and down until I accepted my doctor’s advice. She of course was right. So was the doctor. I made an appointment for this new development. I don’t know all the real medical terms, so I will give you my version. Dr. Joseph Pham of Pacific Northwest Eye Associates is my primary eye doctor. He suggested a retinal expert. The expert was a major from Madigan Army Hospital. The major suggested that injection into my eye. Multiple injections into my eye. A picture of a normal retina shows two minor hills with a valley in-between (see within green circle). The higher the hills, the bigger the problem. I have a friend who doesn’t like to be confined and doesn’t like to hear about medical procedures. So of course after I started treatment I explained in detail how it went. “I wouldn’t say that it’s a long needle, but he sticks it in my eye from across the room and then walks it in.” I continued on, “The worst part with the injection is the maniacal laughter of the doctor.” My friend was not amused. 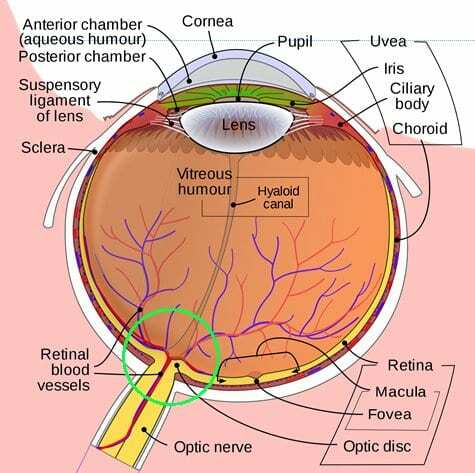 Basically, the problem is blood vessel leakage in my retina. An injection of Avastin, a cancer drug used to shrink blood vessels to strangle and stop the spread of cancer, reduces the leakage and the mushiness of the retina. A picture of a normal retina shows two minor hills with a valley in-between (see within green circle). The higher the hills, the bigger the problem. Each appointment involves pictures of both eyes and usually results in an injection. I think everyone as they grow older should have their eyes checked regularly. I liked the major. He traveled out of the country into middle and South America volunteering to help with eye problems. A nice guy. My second retinal expert had a nicer touch with the injection. The major retired and left the army and Madigan. The second doctor had an office in Bellevue, but came down to Tacoma on Thursdays. When he decided to stop driving to Tacoma, I briefly considered traveling to Bellevue for treatment. However, the consideration didn’t last long when I thought of the traffic. I forgave my doctor for leaving, but didn’t follow him. My third retinal expert is Dr. Brenda Myers-Powell. She also has a nice touch and a keen eye for detail. She visits Pacific Northwest Eye in Tacoma on Thursdays. Her office is located in Federal Way. I have visited her office for non-Thursday treatment. Dr. Pham remains my main eye doctor. He does a fantastic job caring for my eyes. I think everyone as they grow older should have their eyes checked regularly. Watch the pressure! Am I healed? No, but I can still pass the driver’s license eyesight test. Perhaps, one day we will have computer assisted vision like Lieutenant Commander Geordi La Forge from Star Trek: The Next Generation. Personally, I’m waiting for computer assisted taste sensors so you can lead to a future article. Thanks for the brain start!